Flower Power - Rocky Mountain Great Dane Rescue, Inc.
RMGDRI is a completely non-profit organization. We derive our operating funds from donations and Fundraisers. No member of RMGDRI receives any compensation for the work they do. Teagan is a 5 1/2 year old merle Great Dane that experiences constant swelling of the front left leg. After performing numerous diagnostic procedures, veterinarians have determined that Teagan suffers from a condition known as Lymphedema. 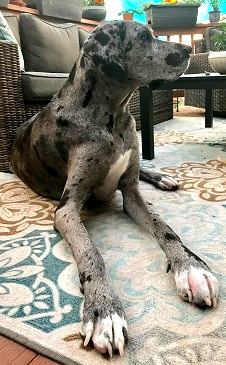 What makes Teagan’s case so peculiar, is that his Lymphedema presents in such an unusual way that leads veterinarians to believe Teagan has a genetic abnormality of the lymph vessels causing the fluid congestion in that leg. Unfortunately, we have not yet found a treatment that takes the swelling away completely. But, we have been able to manage his symptoms very well with routine Acupuncture & Cold Laser Therapy. We have seen such a remarkable difference in Teagan since starting Acupuncture & Cold Laser Therapy that we are determined to raise enough money to purchase Teagan his very own at-home Cold Laser Therapy unit. Will you buy a flower to help this handsome guy?